The younger the child, the more we worry about missing a decompensation. Encourage the parents to call the child’s primary care clinician for a re-check in a few days, and to discuss whether or not further work-up such as imaging is indicated. As always, strict return to ED precautions are helpful. 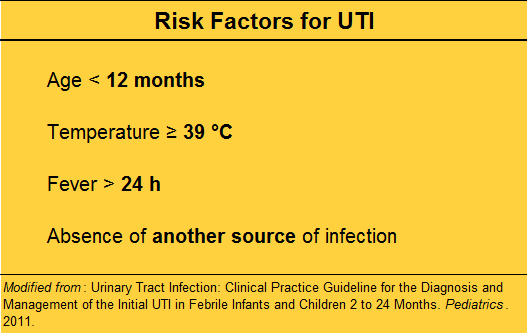 If a child over 3 months of age is well, has no comorbidities, has a low grade fever “in the 38s” (38-38.9 °C) without a source, especially if less than 24 hours, you are very safe to do watchful waiting at home. Shaikh N, Morone NE, Lopez J, Chianese J, Sangvai S, D’Amico F, Hoberman A, Wald ER. Does this child have a urinary tract infection? JAMA. 2007 Dec 26;298(24):2895-904.